Since the company started, it has expanded to include low oil volume, high efficiency, specialty food and drop in fryers in addition to water cookers and holding units. Pitco is headquartered in Bow, NH with a production location in Pembroke, NH. 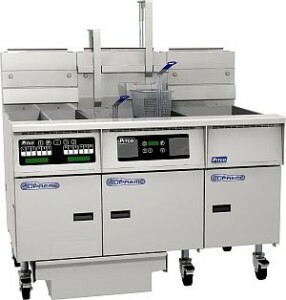 For Energy Saving High Production frying, specify a Pitco Solstice Supreme fryer. Theses tube-fired gas fryers with Solstice Supreme burner technology provides dependable heat transfer and fuel saving performance, without the need for complex power blowers. This patented atmospheric burner system, reaches up to 70% thermal efficiency and delivers lower flue temperatures. Self Clean Burner goes through a daily cleaning cycle to keep your burners tuned to operate in the most energy efficient manner. Ventilation troubles are virtually eliminated with the Down Draft Protection (patent pending) that safely monitors your fryer, making this a low maintenance, highly reliable fryer. No Blower, No Air Switch – Fewer moving parts add to greater reliability. Select Solstice Supreme models qualify for energy efficiency rebates. Rebates can exceed $1000 per pot, depending on location. Please see crpeterson.com/rebates for more information, or contact your local program administrator.